Chart-topping, DJ/producer Avicii announced that he will be launching his North American #TRUETOUR. Promoted exclusively by Live Nation and produced by At Night Management, the tour will kick off on April 10 in Boston, MA at the TD Garden and visit several major cities throughout North America including New York City, Toronto, Washington DC, Boston, Phoenix, Houston and Chicago, with additional cities to be announced later this year. Tickets are on sale starting Friday, January 31 at 12:00 PM Local Time through the Live Nation mobile app and at www.livenation.com. 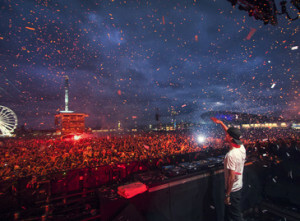 Avicii is renowned for his spectacular live shows, bringing audiences to ecstatic moments of party bliss and ‘driving the crowd bonkers” (Rolling Stone). The new tour will showcase an all new, world class production. Just recently, when the European leg of #TRUETOUR hitting London, Paris, Amsterdam and Stockholm was put on sale, it sold out in minutes. Avicii broke out with his international mega-hit “Le7els” which conquered club charts worldwide, garnered over 83 million YouTube views and sold over 4 million singles; and“Silhouettes,” which netted over 40 million views. 24-year old Avicii leads the next generation of electronic music producers to explode, propelling him into the ranks of superstar DJs who are able to perform to massive crowds. He is the face of Denim and Supply Ralph Lauren which has been a true creative partnership between Avicii and the brand. Avicii and manager Ash Pournouri, AT NIGHT MANAGEMENT, have donated over $2.5 million to hunger initiatives through their House for Hunger charity, including royalties from Avicii X You, the first ever worldwide music collaboration.